The CRISPRainbow technology developed by the Pederson lab uses CRISPR/Cas9 to tag up to seven different genomic locations. This unique labeling system will allow scientists to track DNA movement in live cells and study the structure of the genome in real time. This kit will be sent as bacterial stabs. Multiplexed labeling of genomic loci with dCas9 and engineered sgRNAs using CRISPRainbow. Ma H, Tu LC, Naseri A, Huisman M, Zhang S, Grunwald D, Pederson T. Nat Biotechnol. 2016 Apr 18. doi: 10.1038/nbt.3526. PubMed PMID: 27088723 . 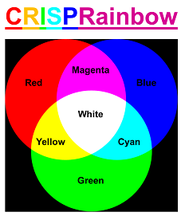 CRISPRainbow is a system that uses dead Cas9 (dCas9) and gRNA scaffolds that bind fluorescent proteins. 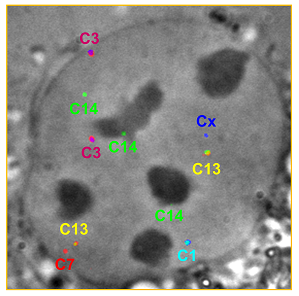 This technique was used to simultaneously image six colors in order to label chromsomal loci. Labeling multiple chromsome-specific loci from Ma et al, 2016. 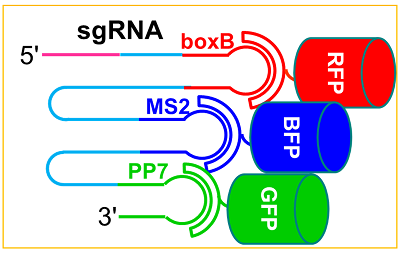 PubMed PMID: 27088723 .
sgRNA design for tertiary color generation of white; Represents sgRNA with three elements (boxB, MS2, and PP7) as well as the three binding partners with their respective fluorescent proteins; from Ma et al, 2016. PubMed PMID: 27088723 . Please note that plasmid pHAGE-EFS-PCP-3XNeon-nls is not included in this kit. If you need this plasmid for experiments, it must be ordered separately.